- "Etna" focuses on greater interoperability, enhanced multi-channel delivery and content optimization. - Cloud edition - SaaS version on Red Hat Enterprise cloud stack, with Finnish eZ Partner, Ixonos - offers new WCM paradigm. 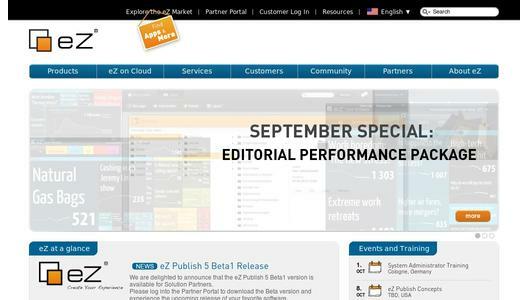 eZ Systems (www.ez.no) announces it has again fulfilled on promise to deliver feature-packed bi-annual release of its Enterprise Open Source CMS. The May 2012 release reflects the continued drive to enhance the eZ web content management system (WCM) to offer a full Customer Experience Management (CXM) suite. eZ Publish Enterprise now integrates its info-graphic analytics solution, eZ odoscope, directly into the back office, integrating content production with performance measurement. For delivery to mobile, eZ has enhanced its adaptive technology to faster streamline and improve automated rendering of content to the small screen. Geo-location of content also receives a boost to help businesses adapt to the mobile web-user's needs and expectations. eZ Find, eZ's powerful search engine, has gained improvements in faceted search, spell checking, auto suggestions and more to ensure that user experience is satisfyingly efficient. The eZ Market, eZ's solution for bringing certified 3rd party performance and productivity innovation into the mix sees exciting additions in the areas of real-time content trending measurement (eZ Live Viewer), fluid and collaborative workflow tools (eZ Exceed and eZ Multitasking One), tagging automation (eZ Smart Tags), and eCommerce (eZ Way 2 Magento). The eZ App Factory offers industrialization and rapid creation of low cost, easy to manage native mobile and tablet apps that integrate fully with the eZ Publish CMS. The eZ Publish Cloud edition, based on the Red Hat Enterprise cloud stack, offered in partnership with Ixonos, is a full SaaS version of eZ Publish Enterprise. The benefits of cloud enablement are many - speed, security, support, cost and more - allowing eZ clients to focus on the core of their digitally-enabled business, leaving infrastructure to international best-in-class third party vendors. Gabriele Viebach, Group CEO commented, "eZ is committed and transparent in its roadmap to deliver the world's leading Customer Experience Management platform. 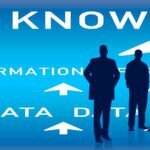 This is a great testimony of how teamwork with the eZ Community and our own engineers delivers fast innovation within the Commercial Open Source paradigm to produce relevant and sustainable software to enable the digital businesses of today and prepares them for the exciting possibilities of tomorrow." 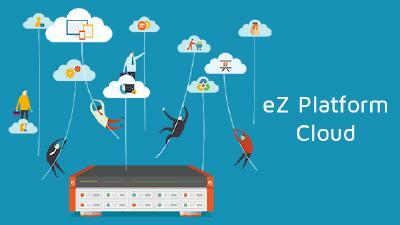 eZ Systems is the globally recognized commercial open source software provider. Our leading and innovative approach takes your enterprise platform beyond content management (CMS) into creating a true digital experience with systematic optimization capabilities. The eZ Publish platform sets new standards for digital lifecycle management, including recommendations and smart web analytics functionality, coupled with an application market place of certified extensions. Thousands of organizations worldwide benefit from optimized and intelligent multi-channel communications solutions. eZ's client base includes small, medium and large enterprises across all industries such as media, publishing and broadcasting, financial services, telecoms, retail, government, manufacturing, logistics, and education.